Annyeong, Altheans! Have you purchased any of Althea Exclusive products? Participate in our review event to let us know what you think of the selected product(s) of the month & receive $0.5 Althea reward points* for each review dropped. 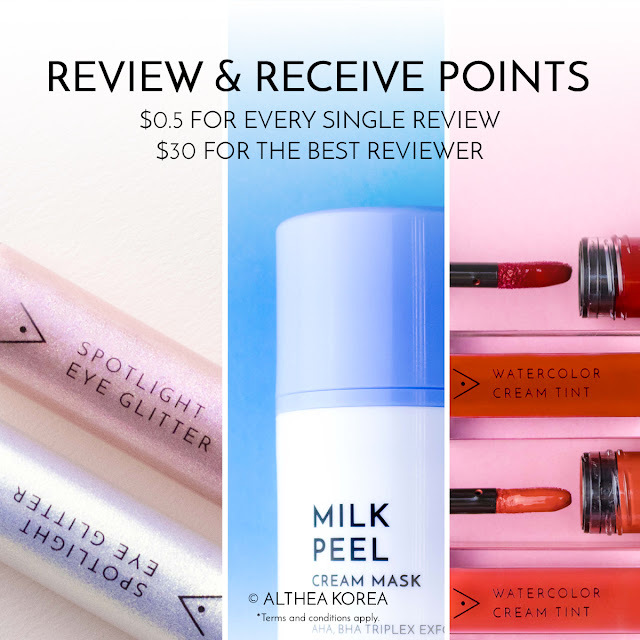 We will also pick ONE(1) best reviewer for each product to receive $30 reward points*! Winner(s) Announcement: 2nd Week of April 2019. Make sure to be logged in into your Althea account before dropping your review. What are you waiting for? Head on down to Althea's site now and find these products under the Althea Exclusives tab! 1. The contest is open to all Althea Exclusive verified buyers. 2. Unverified reviews will deem the entry as invalid. 4. Althea rewards points value received will be converted accordingly based on winners' resident country. 6. Winner(s) will be announced via Althea blog and contacted via email. 7. Althea reward points received will be valid for 30 days. The expiry details will be available on My Account > My Reward Points. 8. Althea reserves the right to amend the terms & conditions set herein without prior notification. 9. Althea general terms and conditions apply.